Oregon: A free chart offers an alphabetical list of all Oregon wines reviewed for the tasting report in this issue. WineSpectator.com: Get our latest editors' picks and thousands of other new reviews on the go with the WineRatings+ app, which offers access to Wine Spectator's 332,000 expert ratings, as well as curated lists and top values. The newly revamped version for iOS includes enhanced search options and alerts when new ratings are added, making it easier than ever to find the right wines for you. Find WineRatings+ at the App Store or Google Play. WineSpectator.com: Keep on top of exciting editors' picks throughout the year with Wine Spectator's free email newsletters. Sips & Tips features a great value wine each week, while the twice-monthly Collecting highlights cellar-worthy wines that can benefit from aging. WineSpectator.com: BONUS VIDEO Cabernet Passion with Daou: Although Paso Robles is best known for Rhône varieties, this California region's Cabernets deserve serious attention. Tour one of Paso's top Cabernet vineyards with brothers Georges and Daniel Daou. WineSpectator.com: BONUS VIDEO Willamette Valley Pinot Noir Grows Up: Chehalem founder Harry Peterson-Nedry, who has grown grapes in this Oregon region since 1980, fills you in on what to expect from Willamette Pinots in terms of flavor, structure and aging. WineSpectator.com: BONUS VIDEO Rust en Vrede's Jean Engelbrecht: An eloquent ambassador for the wines of South Africa, the vintner presents a snapshot of the country's past, present and future, along with an outstanding example of one Rust en Vrede's outstanding red blends. WineSpectator.com: BONUS VIDEO Wine Star Ken Wright: "To understand Oregon is to understand geology," says the pioneering winemaker, who produces a dozen single-vineyard Pinot Noirs under his own label. Wright explains how his Pinots are shaped by Oregon's distinctive soils. 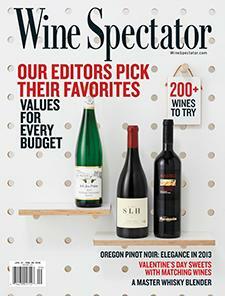 WineSpectator.com: FREE: Oregon Alphabetical Listing - More than 640 wines were reviewed for this report. A free alphabetical list is available. WineSpectator.com members can access complete reviews for all the wines tasted using the online Wine Ratings Search. WineSpectator.com: Members can browse complete tasting notes for all wines reviewed in 2015 via our online Wine Ratings Search. To narrow down the list, select "Advanced Search Options" and choose additional criteria, such as price, score, region or variety. WineSpectator.com: Members can reference our full archives of Owen Dugan’s columns and other articles about chocolate. WineSpectator.com: Find restaurants with great wine lists in our Restaurant Search. With more than 3,600 award winners for 2015, pick the perfect dining spot by location, award level, wine strengths, cuisine type and more. TOP STORIES OF 2015 What were the hottest topics of the past year? We rounded up the most popular articles, blogs, tasting reports, videos and Unfiltered items for 2015. Find out what you missed, or revisit your favorites of the past 12 months, in our News & Features section. 2015 HARVEST REPORTS With the newest wines now aging in winery cellars, Wine Spectator editors provide an early look at expected vintage quality in key European and North American regions, such as Bordeaux, Burgundy, Napa, Sonoma and more. VALENTINE'S DAY We've got everything you need for an inspired night of romance: A recipe to impress from one of the country's top chefs, standout sparkling and sweet wines, the best chocolates, restaurants with award-winning wine lists and more. Premier Cru vs. Grand Cru Champagne: What do these terms mean on a Champagne label? Learn the difference—in time for your Valentine's Day celebrations—with Duval- Leroy chef de cave Sandrine Logette-Jardin and senior editor Alison Napjus. Washington's Champoux Vineyard: What makes a great vineyard? Andrew Will Winery owner Chris Camarda illustrates the influence of site and blending with two elegant Bordeaux-style reds from this famous vineyard in the Horse Heaven Hills AVA. The Wine Stars: Top vintners from around the world shared their stories—and their wines—at the 2015 New York Wine Experience. Hear from Château Lafite Rothschild's charming Baron Eric de Rothschild, Napa cult Cabernet maker Bill Harlan, the Italian father-daughter team of Angelo and Gaia Gaja, and more. RATINGS ALERTS Start the new year off right by getting early updates on the smartest buys and hottest collectibles from our editors' latest tastings. Insider: Weekly reviews of highly rated wines before they sell out. Advance: Sneak peeks at top picks from upcoming issues of the magazine. Ratings Flash: This e-mail alert will let you know when we've added new reviews to our Wine Ratings Search from your favorite wine regions. Sign up and enter your preferred regions—we'll do the rest! VALUE WINES Did you resolve to save more money this year? You can still drink great wines without spending a lot. Check our site regularly for updated quick lists of Top Values, Easy Finds and Wineries for Values.